Orinoco Royal Mail Line steamship built 1886 by Caird & Company at Greenock. The Orinoco was a passenger and cargo vessel running between Southampton and the West Indies. In 1906 she collided with the Kaiser Wilhelm der Grosse off Cherburg with the loss of several crew members. 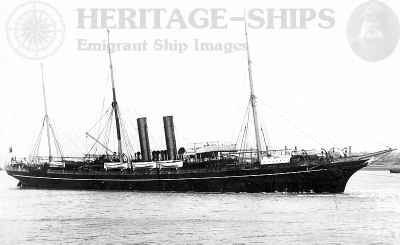 Description : Royal Mail Line steamship built 1886 by Caird & Company at Greenock. The Orinoco was a passenger and cargo vessel running between Southampton and the West Indies. In 1906 she collided with the Kaiser Wilhelm der Grosse off Cherburg with the loss of several crew members.